SARATOGA SPRINGS, N.Y. -- The American Expeditionary Force of World War I, led by General John Pershing, wanted to break the four-year-old stalemate of trench warfare when the U.S. entered the fight in 1918. The National Guard's newly battle-tested 42nd Division did just that when it went on the offensive in its first major attack near Chateau-Thierry in late July, 1918. The fight would be part of the division's role in the Aisne Marne campaign. The German effort to end the war in late spring and summer of 1918 had expended itself against the defense of American and French forces at Champagne on July 14. Five days after that trench fight, the division moved by train to the area near Château-Thierry and rested for three days before receiving orders to attack. Allied commander Ferdinand Foch ordered the 42nd "Rainbow" Division to drive northeast on July 25 and push the Germans back from their threat to Paris. This fight would be outside the trenches that Rainbow Soldiers had lived in since March. It was the kind of maneuver warfare Pershing had pushed for his American troops. It would see some of the division's fiercest fighting on two separate battlefields – the Croix Rouge Farm and Ourcq River-and bloody the division's famed infantry regiments. First into the fight were Guardsmen from the Alabama and Ohio Regiments, the 167th and 168th Infantry Regiments. The regiments, part of the division's 84th Brigade, stepped off on the attack on July 26. For once, the ground in front of the Doughboys was free of barbed wire, mines and torn up ground from artillery bombardments. But it also meant that the open fields would become the killing ground for prepared German defenders at Croix Rouge Farm. The farm, the first division objective of the attack, dominated the Marne Valley leading east to Reims. The Germans had more than a month to prepare. The walled compound of the large farmhouse dominated a slight rise from which fire could be delivered in all directions. The Germans planned a strong defense with a large number of machine guns, each served by a five-man crew. About 25 of the guns were later captured. Together they could pump out 10,000 rounds a minute and were accurate up to 1,000 yards. Camouflaged and placed in fortified positions, they covered tree lines and trails. Fields of interlocking fire had been measured and mapped. Trees had red paint marks on them to help with sighting. Snipers were put into planned positions. Soldiers from New England, the 26th Yankee Division, had attacked first. Unable to seize the farm, they were relieved on July 25th by the Rainbow Division which launched its own attack on July 26th. "The path over which the American divisions passed, driving the Hun (German forces) before them, is almost completely paved with the names of National Guard units - in a northeasterly direction from the Marne to the Vesle, by the 26th and 28th, in the beginning; by the 42nd and 32nd, for the greater distance and past the most difficult positions, and at the end of the advance, again by the 28th Division," wrote Captain William H. Amerine, historian of the 167th Infantry in his 1919 account, "Alabama's Own in France." The attack was fierce and costly in casualties for the Rainbow Soldiers, noted historians. "All that afternoon the wooded slopes around La Croix Rouge Farm formed the ring in which a terrific battle went on," wrote Raymond Thompkins in his 1919 "Story of the Rainbow Division." "The men of the Rainbow - Alabamians on the left of the farm and lowans on the right - had their first experience with those withering blasts of machine-gun fire with which the German army protected its masterly retreat during all the days that followed." After consolidating his battalions on the farm grounds, and seeing the Germans forming for a counterattack, the 1st Battalion Commander, Major John W. Carroll, was heard to shout to his Doughboys, "Save your fire men! We'll give 'em hell with the bayonet." The close quarter fight was fought with grenades, rifles and the bayonet, but the Alabama regiment held its objective. "...the 167th Alabama assisted by the left flank of the 168th Iowa had stormed and captured the Croix Rouge Farm in a manner which for its gallantry I do not believe has been surpassed in military history," wrote General Douglas MacArthur in his 1964 memoir, "Reminiscences." "It was one of the few occasions on which the bayonet was decisively used," he wrote of his time as the Rainbow Division chief of staff and later that summer, the commander of the 84th Brigade. The German defenders established a new defensive line to the east. "The Hun was on the run after having suffered a decisive defeat; and the Chateau-Thierry salient had almost disappeared," Amerine wrote of the battle. "Its spearhead no longer pointed towards Paris-the heart and soul of France-and the Alabamians had written the name of the Croix Rouge Farm into a thankful nation's history." "It was the key to the position on that line, and finding it too hot to hold they retired nearly six kilometers to a new defensive line across the Ourcq River," Thompkins wrote. Passing through the Croix Rouge Farm to the Ourcq River, Soldiers of the 165th Infantry believed the Germans to be in full retreat. When the New York Soldiers, the famous "Fighting 69th" Irish immigrants, crossed the river July 28, they learned that the Germans were far from gone. "The Germans had blown up two bridges near Sergy; the stream was swollen with rains to a width of fourteen meters and a depth of four, and the men had to struggle through the little torrent," Thompkins wrote in his division history. "Machine guns opened on them from Sergy directly in front and Meurcy Farm on the flank and the stream ran red with the blood of the Rainbow," he wrote. The 165th Infantry crossed and established the first foothold on the eastern bank. By noon the other four regiments of the 42nd were established; Ohioans of the 166th on the extreme left, New Yorkers next, then the Alabamians of the 167th and on the extreme right the 168th from Iowa. Just a few days after taking Croix Rouge Farm, the Alabama and Iowa regiments were again in heated combat. "Once on the enemy's side of the Ourcq, Colonel Screws' men from Alabama and Colonel Bennett's men from Iowa rushed Sergy and took it. They were swept back to the river bank by machine-gun blasts from the woods on the left. They rallied, rushed the village again, and this time ran into one of the best divisions in the German Army, the Fourth Prussian Guards," Thompkins wrote. "Americans who were at home then will remember the thrilling message of (French political leader) M. Andre Tardieu, who wrote - "Today, American Soldiers met and defeated on the River Ourcq the best troops of the Prussian Guard,"" Thompkins wrote. The battle would ebb and flow throughout July 28th and again on the 29th. Sergy would change hands seven times during the course of the battle before the Doughboys were forced back to the river bank. With the 165th Infantry, losses were also staggering. After seizing their objective on July 28, Meurcy Farm, about a mile in from the river, the regiment was forced back to its crossing site on July 29 before launching a final attack to seize the heights over the Ourcq. Among the dead in the ranks of the 69th on July 29 was Sgt. Joyce Kilmer, an intelligence analyst with the regimental headquarters and famous poet. He was killed by a sniper's bullet while conducting a reconnaissance with the 165th commander, Lt. Col. William Donovan. 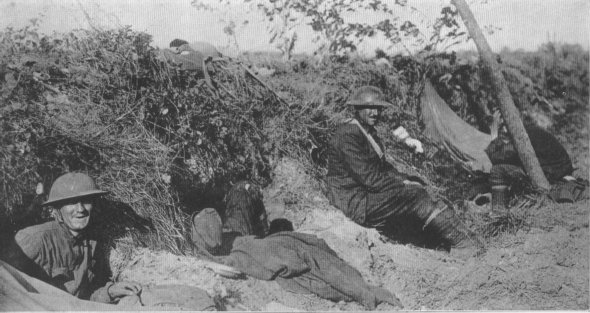 Casualties for the Rainbow Division during its Champagne Defensive and attack to the Ourcq River cost the unit 184 officers and 5,469 men, or roughly one quarter of its entire strength. Replacements would arrive in August, newly trained draftees to bring the 42nd Division and its regiments back to full strength. "No Soldiers in the world were more willing than the Americans to come to close quarters with the enemy and fight it out with bayonets," Thompkins wrote. "The difficulty the Rainbow was finding here on the Ourcq was in getting to close quarters without being killed or disabled. Rushing through the open up to the concealed German machine-guns in the hope of frightening the gunners into surrender, or of catching them off their guard, was sheer suicide." The lessons and replacements would be needed, as the Rainbow would go back into combat on September 11. General Pershing had come to trust the division to achieve its combat objectives, and the Rainbow would be present for the first all-American offensive of WWI at St. Mihiel. During the World War I centennial observance, the New York National Guard and New York State Division of Military and Naval Affairs will issue press releases noting key dates which impacted New Yorkers, based on information and artifacts provided by the New York State Military Museum in Saratoga Springs, N.Y.